I have used Die'sire essentials Stars and the diamond press alphabet along with craft card and fancy papers and TH distress ink. Great job! I would love for you to share with us at Die Cuttin' Divas. Our theme is masculine/Father's Day. We have an awesome sponsor this week. Fabulous card! Thanks so much for joining us over at Crafty Cardmakers this time, hope to see you again! A wonderful card, I love the tags, great colouring. Thanks for joining in the fun at Cardz 4 Guyz. Caz. DT. Gorgeous card!! Love the pretty papers and great design!! Thanks for joining us at DCD this week! Fantastic card..... Love it. .. 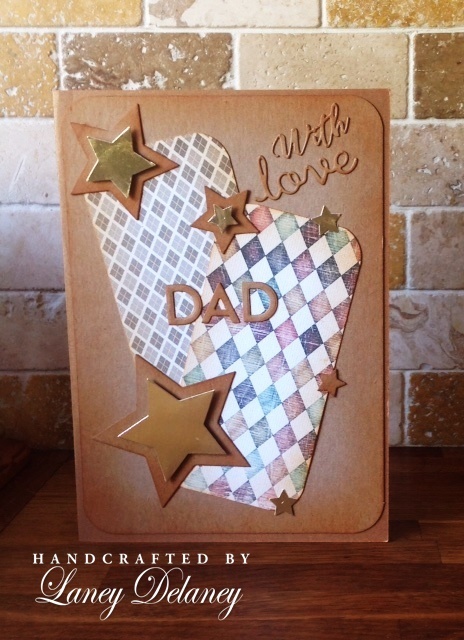 Thanks so much for your amazing entry at Crafty Cardmakers Challenge. Very nice !! Thanks for playing along at Stinkin' Inkers challenge this month. Lovely project. Thank you very much for entering the challenge at Craftyhazelnut's Patterned Paper Challenges. The neutral color palette with the pops of gold is really stunning. So glad you shared your creation at Simply Create Too.